The Gardner modular Chemical Blending System permits blending up to nine different chemicals into three blended chemical storage tanks. Fingertip controls permit complete programming of liquid chemical mixtures while the entire operation is monitored on a visual display. This system replaces individual peristaltic pump systems and eliminates mixing by manual labor. Available with 1, 2, or 3 blended storage tanks, it has the capabilities for connections to remote status/control panels. 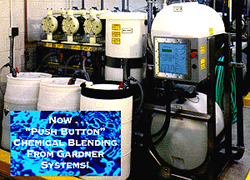 Each system has a mix/transfer pump for transferring and mixing raw chemicals. Chemicals are mixed in a mix tank, then pumped into a blended chemical storage tank to await distribution by blended chemical transfer pumps.